BMO's flagship bank branch bears little resemblance to the bank branch of old. On an early summer evening in June, Kelly Bowers packed up her Dodge Ram pickup with the tools of her trade: a laptop, a mobile scanner and a homemade stew. She drove to a grain farm near Saskatoon and met a farmer in his field. There, she completed a mortgage application for the farmer, who wanted to buy a house for his son – and she shared the food she had brought with her. "There's nothing better than going out to a field and having your supper," she says. "Growing up, that's what we did. We'd always go to the field with my mum and she'd feed my dad. That's what farmers do." Except that Ms. Bowers is not a farmer. She's a mobile adviser with Canadian Imperial Bank of Commerce. 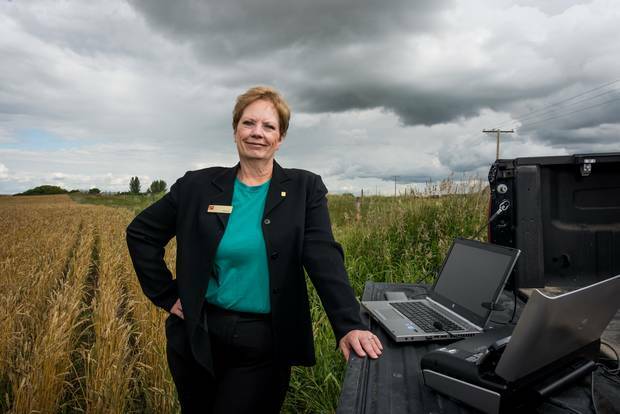 She uses her home near Saskatoon as a base to travel throughout the region, including Prince Albert and Lloydminster, meeting customers who either can't get to a bank branch or simply don't want to. "I'll meet you anywhere you want to go," she says. "Farmers can't just jump off the tractor and zip into town. So if they want to meet, I'll meet them in their field." Kelly Bowers, a mobile adviser with CIBC, sets up a makeshift office in the back of her truck near Delisle, Sask., on Aug. 17, 2015. It's a good service. But it also signifies an astonishing shift in the way banks are interacting with their customers as technology, consumer behaviour and tech-savvy new competitors drive what many observers believe are the biggest changes ever seen in the financial services industry. Just as disruptive new technologies sank firms such as Blockbuster and Tower Records, some observers believe similar forces are lining up against the financial sector. The threat is most noticeable at bank branches. Once the strongest connection with customers, branches are now trying to find their way in a world where most of us bank online. Yet banks are investing in them: Old edificies that appear hopelessly out-of-touch with our digital world are slowly being replaced by revamped formats that are borrowing concepts from Apple's retail stores. "We are catching up. The branch format is changing," says Tim Hockey, the group head of Canadian retail and wealth management at Toronto-Dominion Bank. Sometime in the future, "there will be fewer branches, and that's partly because consumers will not see as much need to have one close at hand." According to the Canadian Bankers Association, 55 per cent of Canadians are doing most of their banking online. Mobile banking is taking off too: 31 per cent of Canadians are using their smartphones to check balances, move money, pay bills and deposit cheques, up from just 5 per cent in 2010. For those who can't complete complex procedures online or need advice, mobile advisers like Ms. Bowers suggest that visiting a bank is no longer the only alternative – explaining why some bank branches look awfully quiet during some hours of the day. That puts branches in an awkward place, especially when you consider their cost. According to Meny Grauman, an analyst at Cormark Securities, a transaction at a bank branch costs the institution about 50 times what a mobile banking transaction costs. If banks cut their branch footprint by just 10 per cent – through either closures or smaller formats – the savings in rent, salaries and equipment would drive up their earnings by an average of 2.7 per cent, Mr. Grauman estimates. "The cost of operating bank branches is significant," says Ian Cunningham, chief operating officer at Tangerine, a branchless division of Bank of Nova Scotia. "You need to have expertise in all these different locations to provide financial advice and product advice. It's very difficult and expensive to do." U.S. banks appear to have done this math, and have been cutting branches even as the economy improves and the once-rattled banking sector stabilizes. According to the Federal Deposit Insurance Corp., U.S. banks closed 1,400 more branches than they opened in 2014, five years after the depths of the financial crisis. JPMorgan Chase & Co. has announced plans to shut 300 branches, or 6 per cent of its footprint, in 2016. However, Canadian banks have been moving in the other direction, expanding their networks under the belief that branches remain integral to their operations. They operated a total of 6,348 branches in 2014, up 127 from the previous year and more than 400 since 2006, according to the CBA. "People are not going into branches as much as they used to," says James McPhedran, executive vice-president of retail distribution at Scotiabank. "But we're having a significantly higher number of advice conversations in our branches now. They are relevant and they are where big things happen." But branches sure don't look or feel the same. 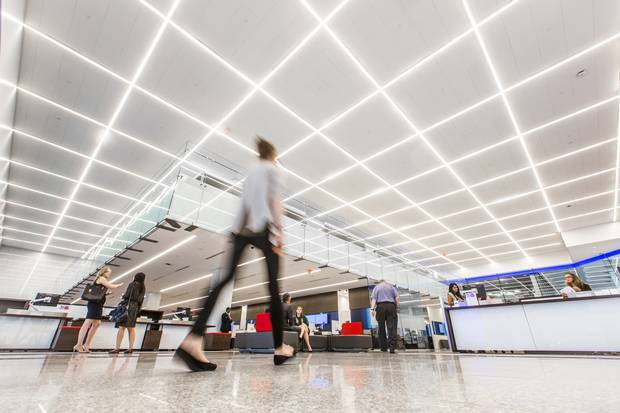 Austere teller wickets are being replaced with open spaces that promote interaction with bank professionals, in an attempt to make branches less about paying last month's cable bill and more about engaging customers with mortgage options and retirement plans. Some banks call their branches "stores," in an obvious nod to retailers. And those tellers are "client advisers." Rather than waiting in line to see a teller, customers at some branches are now greeted by advisers on the floor. A couple of decades ago, these employees were hired for their proficiency in math and accounting; now, according to Royal Bank of Canada, they're hired for their ability to engage people. "The model of what a branch is, is being blown up," says Lian Zerafa, a partner at KPMG who specializes in financial services. Rob Galaski, the national bank and securities leader at Deloitte Canada, barely pauses when asked to describe the changes in the banking sector. "I would say it is unprecedented, in terms of the impact we're about to see on the industry," he says. The industry has encountered upheaval before, of course: ATMs and telephone banking looked as though they could upset an industry not known for being nimble. But this is different. Now, technology is not only making banking more convenient for consumers; it is also encouraging established tech behemoths and tiny upstarts to look at what the banks do, and try to do it better. Bharat Masrani, TD's chief executive officer, warned in May that banking "is changing in fundamental ways and at breakneck speed, as new technologies lower the barriers to entry and innovative competitors emerge." Apple Inc. is one of them. It launched its Apple Pay service in the United States and the United Kingdom, allowing consumers to make small purchases using their iPhones, pushing traditional banks into a more subservient role. Google, another potential rival, is offering a similar service for Android devices. A customer uses an iPhone to pay via the Apple Pay system. Peer-to-peer lenders, allowing people and businesses to get loans online, are gaining traction because they circumvent typical red tape at the banks. San Francisco-based Lending Club has made more than $11-billion (U.S.) in loans since 2007, and says its annual loan volume is doubling each year. Thousands of so-called fintech startups – some led by university students, others by seasoned bank veterans – are busily looking at other ways to take a piece of the banking industry or fill gaps. Venture capital firms are providing billions of dollars in assistance. Brett King, chief executive officer of Moven, a mobile banking app that partners with existing banks, told a New York conference recently that technology companies will become the world's biggest banks in five years. Younger consumers may help drive that shift. Millennials are emerging as the largest cohort in the North American work force, bringing with them what many believe are radical new approaches to technology and brand loyalty. A 2013 survey by Scratch, a brand-consulting unit of Viacom, found that leading U.S. banks were some of the least-loved brands among 15- to 34-year-olds. Millennials were more excited about new financial services coming from the likes of Google, Amazon, Apple or Square, suggesting that Mr. King's audacious prediction of technology companies becoming banking giants might not be so farfetched. "I think that's why we're working with banks," says Scott Robinson, a director at Silicon Valley-based Plug and Play, which assists startups and introduces them to corporations. "They certainly see the same sort of doomsday scenario occurring." While Canadian bankers might not throw around words like "doomsday," they are aware of the challenges they are facing. Mr. Hockey points to an enormous 100-year-old book in his office. It's a ledger where bankers used to record transactions, neatly printed in lines and columns. It's one reason why branches existed in the first place: Ledgers were the financial technology of the day and they needed to be located where the customers were. Branches also held the money that was necessary for most purchases. "Those things are no longer true: Technology can go with you and you don't really need cash," he says. "So that means you experiment dramatically with different types of formats." The experiments are happening on a global scale. Deloitte's Mr. Galaski pointed out that a discussion among senior financial executives at the World Economic Forum in Davos a few years ago revolved around financial disruption, but they didn't attach a particular sense of urgency to it. "Fast forward to Davos just last year, where the same group got together, and the CEO of one of the world's largest financial institutions characterized the mood of the group as 'unhealthy paranoia,'" Mr. Galaski said. "They all agreed that they had to disrupt themselves before being disrupted by others." With that in mind, Canadian banks have been trying to remove just about any barrier to the way their customers want to do their banking. Aayaz Pira, vice-president of digital channels, retail and business banking at CIBC, notes that digital banking used to be handled by IT departments, and chief information officers decided what would be made available. "That model is completely different now," Mr. Pira says. "We are bringing innovation to market because our clients want it and they expect it." On the April day that Apple launched its Apple Watch, both CIBC and Scotiabank announced apps that would allow their customers to check balances, look for nearby ATMs and transfer funds. Banks are also rolling out mobile payment technology and promoting e-mail money transfers and mobile cheque deposits – and some banks are experimenting with conceptual stuff that is still in the labs. Besides building their own impressive technology departments by scooping up hires that might have contemplated careers at Google or Facebook, banks are also fostering outside partnerships so they can gain additional expertise. Some of their innovations are already seeing the light of day. TD and President's Choice Financial have backed UGO, a digital wallet that has attracted 50,000 users since its launch in December. "The fact that our separate structure may better enable innovation, or be quicker to respond to opportunities, is something we think we're beginning to demonstrate," Alec Morley, UGO's chief executive officer, says in an e-mail. Just about every top bank executive is making trips to Silicon Valley, and the banks are maintaining strong ties to startup centres such as Waterloo region's Communitech and Toronto's MaRS Discovery District. "Sometimes it's very difficult for institutions to build some of these new technologies in-house, so we're seeing a lot of the Canadian banks partnering with innovation hubs to get access to this technology," says Adam Nanjee, head of financial technology at MaRS. People walk into a Tangerine temporary bank branch in the Centerpoint Mall parking lot in Toronto on Aug. 18, 2015. Where does this innovation leave branches? For all the new gizmos and apps and self-serve capabilities, Canadian banks have shown a remarkably strong attachment to good old handshakes and name tags. Surveys tell them that this is the right approach because people need a human touch for many of their financial decisions. "I think Canadians still want banking to be demystified, and reassurance that what they are doing today is preparing them for the future," says Kim Mason, RBC's regional president for Greater Toronto. According to Bank of Montreal, 74 per cent of customers prefer to open an account in a branch; 85 per cent prefer to visit branches to buy mortgages. CIBC came to a similar conclusion. Even though 77 per cent of Canadians believe that remote banking is important for day-to-day transactions, 67 per cent prefer to talk to someone about more complex matters. But branches in which these discussions take place are starting to look very different. RBC's new 5,000-square-foot branch at the base of its Canadian banking headquarters in Toronto has eliminated traditional counters. Offices are alcoves with desks that look like warm kitchen tables. Off-hours, you might find a few dozen people attending a financial event. Ms. Mason says that sales transactions have risen 115 per cent since the new branch replaced a 20-year-old version down the street. On a Tuesday afternoon, it's quite busy. Bank of Montreal's flagship branch at the base of First Canadian Place in Toronto was made over on a grander scale, incorporating every conceivable financial service into more than 20,000 square feet of open, airy comfort. People walk through BMO’s flagship branch in downtown Toronto on Aug. 18, 2015. Client conversations can start on the floor with a tablet, then move to a more private area with swivel computer screens, oval tables and even cool-looking chrome-plated staplers. 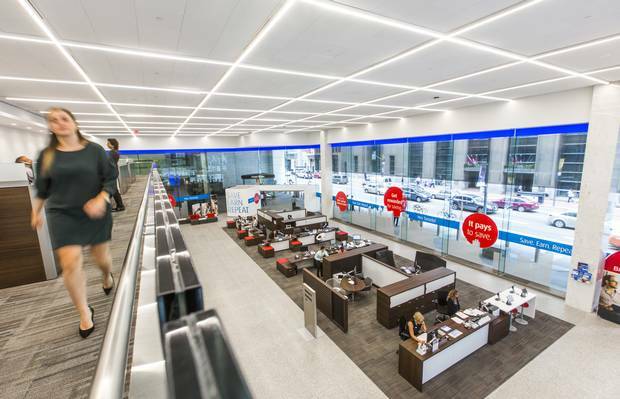 BMO believes that the transformation reflects its brand, and it carries over to other types of branches that can be as small as 1,000 square feet. "When you put in impervious counters or you hide people behind walls and doors, it makes it practically impossible to see that brand aspiration," says Paul Dilda, head of North American branch and ATM channels at Bank of Montreal. Even branchless banks are getting in on the action. 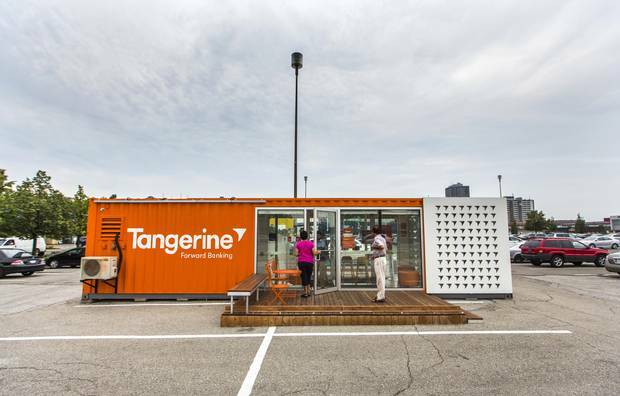 Tangerine has five cafes that serve up fresh-squeezed juice along with iPad demonstrations. The bank is also experimenting with a pop-up branch that is housed in a converted shipping container, offering a striking contrast to the grey pillars that made old banks look stolid. The snazzy new branch formats have one big common element, though: They all work in conjunction with digital banking to create, ideally, a seamless experience for customers who might do their banking on any number of devices. Bankers are calling this an "omni-channel" experience – an aspiration that reflects how dramatically the financial landscape is shifting. But omni isn't cheap, making banks that rely upon branches vulnerable to competitors who can tempt consumers with lower-cost, virtual options. Banks know this, which is why they are experimenting with smaller branches, many of which are attached to new condo developments in high-traffic urban neighbourhoods. BMO's newer branches average about 2,200 square feet, or about half the size they were five years ago. CIBC recently opened a branch on Toronto's trendy Queen Street West that can offer every retail financial service with just three employees – or "universal agents" – in 1,400 square feet. However, no one is ruling out the possibility that a smaller branch footprint could one day also mean a smaller number of branches. "Everybody is trying to figure out what is the digital solution to provide the right experience to clients," says Mr. Cunningham of Tangerine. "And the general direction points to fewer branches and better technology." That might be easy for someone from a branchless bank to say, but others are contemplating a similar future. "Among the Big Five, BMO is the smallest in terms of the number of branches," Mr. Dilda says. "We're not looking to quickly catch up or leapfrog anybody."